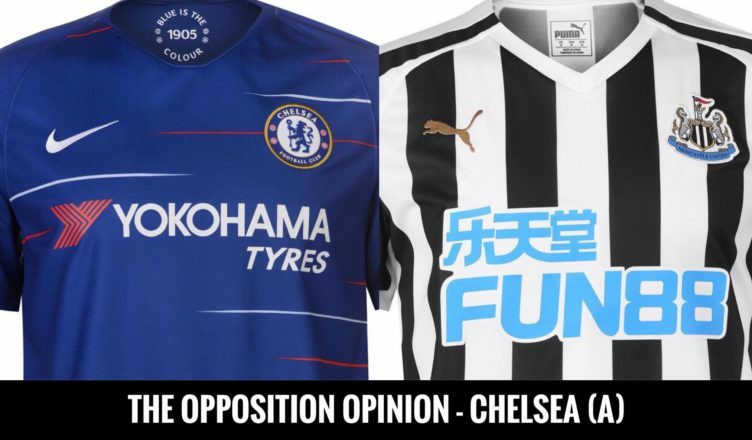 The Opposition Opinion – Chelsea (A) – “T﻿h﻿i﻿s﻿ ﻿i﻿s﻿ ﻿R﻿a﻿f﻿a﻿’﻿s﻿ ﻿l﻿a﻿s﻿t﻿ ﻿s﻿e﻿a﻿s﻿o﻿n﻿ unless ﻿A﻿s﻿h﻿l﻿e﻿y﻿ is ﻿a﻿b﻿d﻿u﻿c﻿t﻿e﻿d﻿ ﻿b﻿y﻿ ﻿a﻿l﻿i﻿e﻿n﻿s﻿.﻿﻿” – NUFC blog – Newcastle United blog – NUFC Fixtures, News and Forum. As ever, we are looking to bring you a view from the other side before this week’s game, chatting to an opposition fan to gain their opinions on NUFC, some insights into their own side and their thoughts on of our upcoming match. Q1 – What short of shape do you feel Chelsea are in coming into this game? Should we take confidence from the fact Southampton got a 0-0 draw at the Bridge in your last league game, or are you expecting a big response? “I am going be completely honest – there is no big response at this moment. “In that final 30 yards we are struggling immensely to create a real chance. There isn’t movement off the ball. There isn’t a typical target man which Chelsea are so used to having over the years – with Drogba and Costa being prime examples. “However with that being said, we just lost to Tottenham and most Chelsea fans have come out that game feeling really good with our performance. Q2 – Kenedy – We were so happy to get him back on loan but a few months later and to say he’s struggling would be an understatement. He looks so low on confidence, sluggish and nothing is coming off for him. There was even talk at one point that we could end his loan early. What do you make of him & why do you think it’s going wrong? “That’s very true. We were hoping to see him really kick on this season. “He is being found out as an extremely attacking player who was a winger until he realised to get into team he needed to adapt. “Unfortunately for him he doesn’t have a defensive bone in his body to become a left-wing back (the only position he’s played in at Chelsea). Q3 – Aside from the obvious, who are the ‘ones to watch’ (hidden gems and biggest weaknesses) in this Chelsea team? Also, do you feel it’s a case of ‘stop Hazard and you’ll stop Chelsea’? “Unfortunately for Chelsea at the moment it does seem like stop Hazard and you stop Chelsea. “Currently we don’t have another player that wishes to take the game by the scruff of the neck or someone willing to carry the team, go on an amazing run or put in a hard tackle, etc. – there just isn’t anybody. They are all just happy to make sure they’re the player that doesn’t mess up. “This season we’ve seen the decline of Willian. He is just a completely different player. Our wingers need a complete refresh. I can see that with tje signing of Pullisic (who’ll arrive in the summer) and hopefully we can keep Hudson Odoi. Q4 – Which players do you see as the strengths and weaknesses in this Newcastle side? Anyone you’re wary of and anyone you don’t rate? “Diame and Rondon would be the 2 main threats. But I feel you will leave Rondon too isolated up top for him to be as effective as he can be. “If Diame is able to get close to Jorginho then that could cause massive issues for Chelsea going forward. “I feel Hazard has a great chance up against Yedlin. At times you can see him have lapses of concentration. Q5 – What sort of game do you think it’ll be and how do you see it panning out? Score prediction? “I’d be extremely surprised so see a high scoring game with us struggling up front. “We will hold most of the possession and you will give us issues with Atsu wanting to prove a point and Perez down Alonso’s side on the counter. Q6 – Which three sides do you see going down & why? Can Rafa keep us up this time? “The 3 teams this year seem quite straight forward. It looks like Huddersfield, Fulham and Cardiff. “These teams just can’t stop teams scoring bucket loads against them. Fulham have changed managers but they need so much more then just that. “This is Rafa’s last season if the club isn’t sold or Mike Ashley isn’t abducted by aliens. Q7 – If you could sign one player from NUFC, who would you like to see Sarri go for? “Rondon! I’d take him tomorrow. “He’s a great target man. He has just the build and all the features required to become successful in a Chelsea team. So, it seems he’s not expecting any big response from his side today, yet he still expects a win and a clean sheet – which probably says everything you need to know about our form at the moment. A big thanks to Raj for taking some time this week to speak with us this week! Next up will be the thoughts of a Cardiff fan ahead of next week’s six pointer at St James’ Park. The makeshift NUFC side that looks likely to start vs Chelsea today – This is worrying..
Olly has been a Junior Magpie from birth. As a season ticket holder and avid Newcastle United fan – he eats, sleeps and breathes all things NUFC. It was a typo mate. Didn’t update last few lines of article – my bad for doing it in the early hours!